Video is a great tool for mango growers seeking information or learning a new technique. Video as a visual information resource is highly suitable for the ‘hands-on’ personalities of many agriculturists, who often prefer to learn from visual instruction, compared with written prescriptions. Videos have come a long way since the first VHS cassettes in the 1990s and DVDs in the 2000s, which were expensive to make and often ran for anywhere up to an hour! Advances in video technology have now enabled non-professionals to quickly make high-quality videos at a relatively low cost. Video duration times have also become much shorter. A recent trend is the production of low cost videos captured using a smart-phone and which often run for two minutes or less! ‘How-to’ and ‘training’ videos are valuable resources for mango growers and are particularly useful for viewing new farming techniques, training workers at the start of the season, or for refreshing knowledge of irregularly used techniques. Information videos of new innovations, products, industry initiatives and research activities are other common video topics. 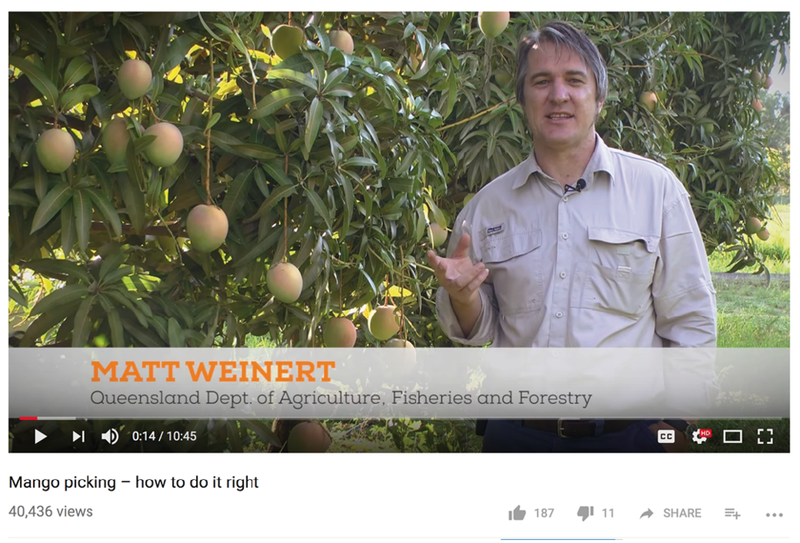 AMIA, and their partners including Queensland’s Department of Agriculture and Fisheries (DAF) have produced several mango videos that are readily available from the Resources section of the AMIA website; just type ‘video’ into the search bar. A search on YouTube will reveal a wealth of other videos resources from both Australia and overseas. Why not have a browse! ‘Mango picking – how to do it right video’ (2014), presented by Matt Weinert. Australia’s most successful mango extension video, ‘Mango picking – how to do it right’, remains a key training resource explaining all aspects of mango picking, including picking technique, optimising fruit quality and maintaining workplace health and safety. This 11-minute video was released in 2014 and was produced by DAF and AMIA, with funding support from Hort Innovation and the Queensland Government. Device used: Mobile phone (44%), Computer (41%), Tablet (11%), Smart TV (4%). In Australia, there have been 4,572 views of this video over three years. The popularity of this video continues to grow every year. During each year, Australian viewing peaks have coincided with the peak mango harvesting period (October–February), with the highest viewing month occurring in January 2017 (853 views). In Australia, the average view time of this video is high at 5:18 minutes, which indicates that most viewers found the content useful, watching a considerable proportion of the video at each occasion. The ‘Mango picking – how to do it right’ video is an example of how video can be used as a highly successful electronic extension delivery method, with the ability to rapidly provide key information on demand. Article submitted by Geoff Dickinson and Kaila Ridgway DAF. Contact geoff.dickinson@daf.qld.gov.au or (07) 4017 0792 for further information. Acknowledgements: DAF’s involvement with the development of electronic extension delivery methods for the Australian mango industry is currently funded via the Australian Centre for International Agricultural Research and the Queensland Government.